I went for a fish yesterday with All Aussie Shock Leader developer Phil Lawlor and his fishing mate Nev. Nev has recently purchased a nice big Sea Jay Barra Masta and, over the past few weeks, the pair have been harassing the local fish population in Morriseys with small plastics and blades on light spin gear. When I got the invite earlier in the week, I jumped at the chance to join them. The pair picked me up at my place about 5.30am and after loading my gear into the boat we all squeezed into front of Nev's ute, like sardines in a tin can! A fuel stop at Alligator creek let us stretch the legs and then we pulled into Morriseys ramp a bit afte 6.30. The wind was blowing and it was drizzling with rain. Dam it was cold! Barra Masta was launched and we were on our way. First stop wasn't to have a fish, but to watch a crazy fox swim the full with of the river just a few bends up Big Salty! He made it across, but would have been cold and wet for the rest of the morning. We continued on our travels and soon arrived at the set of snags we intended to work for the morning. The tide had just bottomed out and good clean water was starting to re-enter the system. Phil was trying out a new technique of fishing a fly rigged with a 'oo' ball sinker. Its then heavy enough to cast on the light spin rods. Nev stuck to the vibes that had been working so well in previous weeks, and I was trying out the new JellyPrawn lure designed by Ben Jones. These lures are quite unique in that they are rigged backward. The theory is that a fleeing prawn doesn't swim forward, but flicks it tail and goes backward. 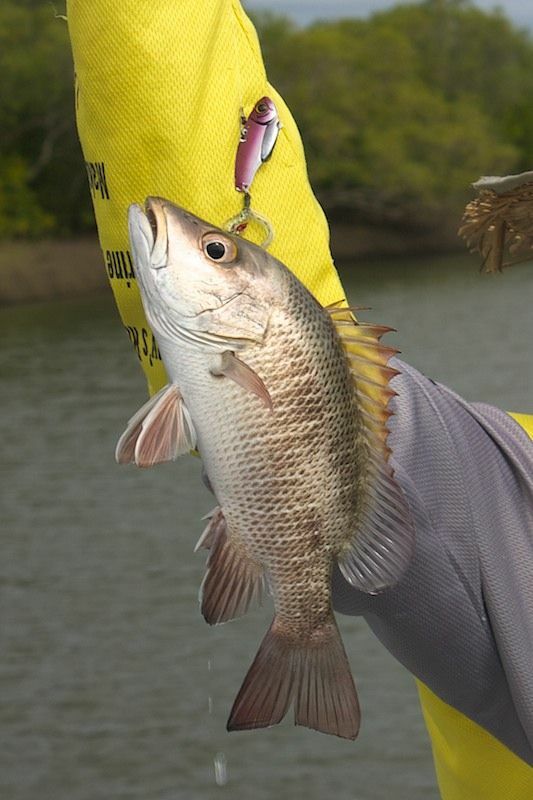 The JellyPrawn lure has this exact tail-flick action when worked correctly with the rod tip. It looks very realistic on Ben's online video footage, and I was sure it would produce the goods. Ben also has a range that include the popular weedless hook configuration, a big advantage in the timber. 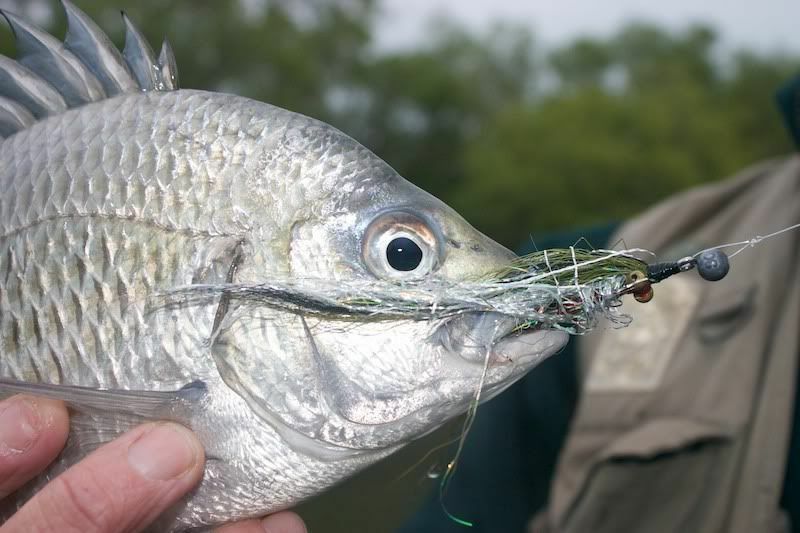 As we were targeting smaller fish like Jacks, Bream and rat Barra in tight timber, I started with the Mini JellyPrawn rigged weedless. 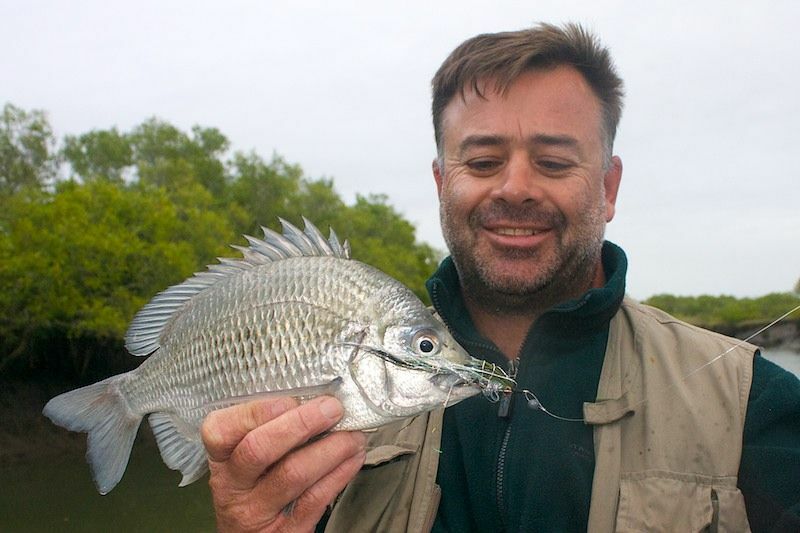 Phil was the first to nail a fish, a solid Bream on the fly that would have gone well over 30cm. 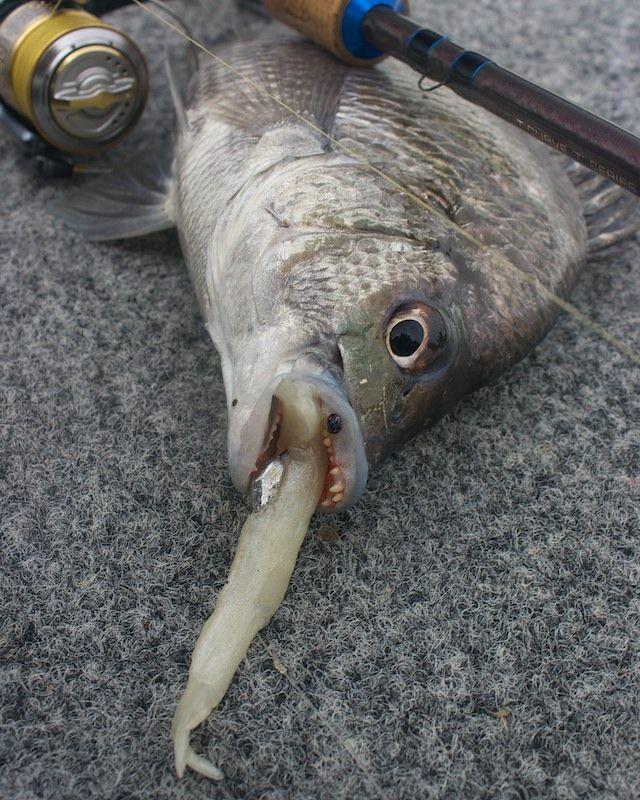 But the JellyPrawn soon took over, nailing a couple of fish in quick succession. 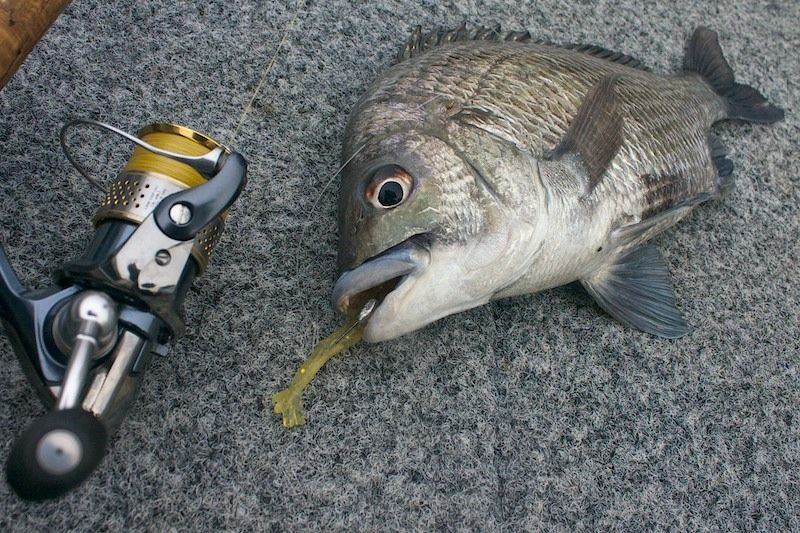 A couple of thumping Bream and a Rat Barra put me in the lead. Nev's vibes just didn't want to play the game for him. 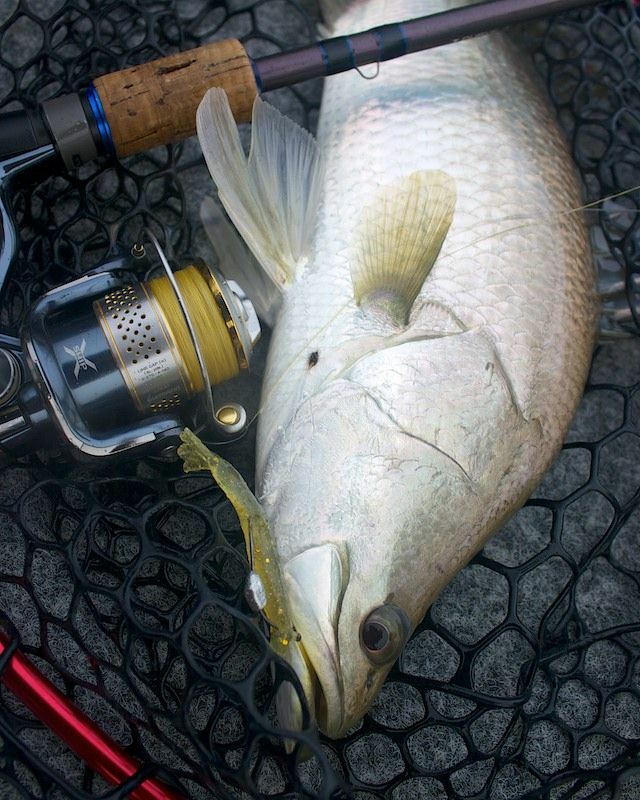 Then came the Barra of the morning! I had tossed my Prawn in behind some structure hoping to find the fish holding tight. I had just said to Phil 'I'll worry about getting the fish out after I hook up, getting that hookup has to come first'. And wouldn't you know it, I hooked up. Well, the video tells it all!! That was the last of my Mini JellyPrawn. I tied on the bigger weedless prawn and continued on. 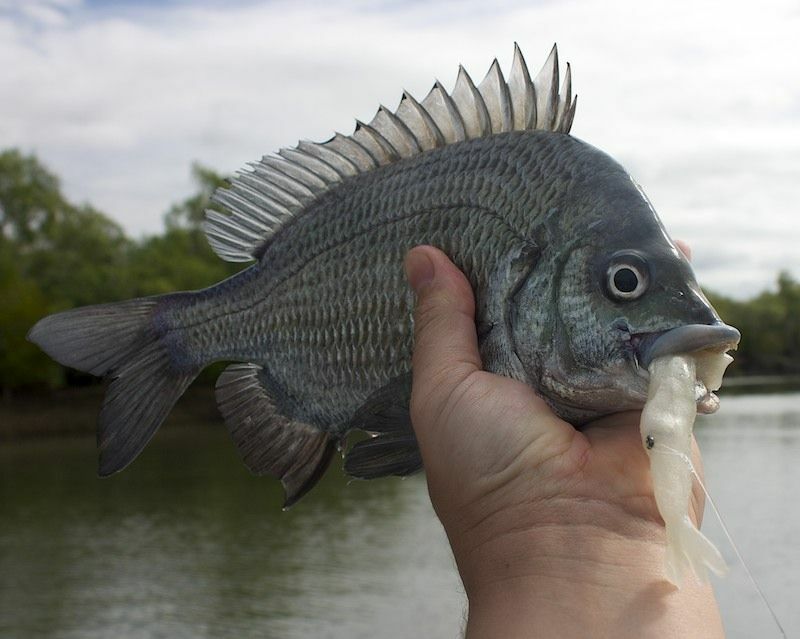 Another thumper Bream and then a real fish smashed the lure and launched into the air. 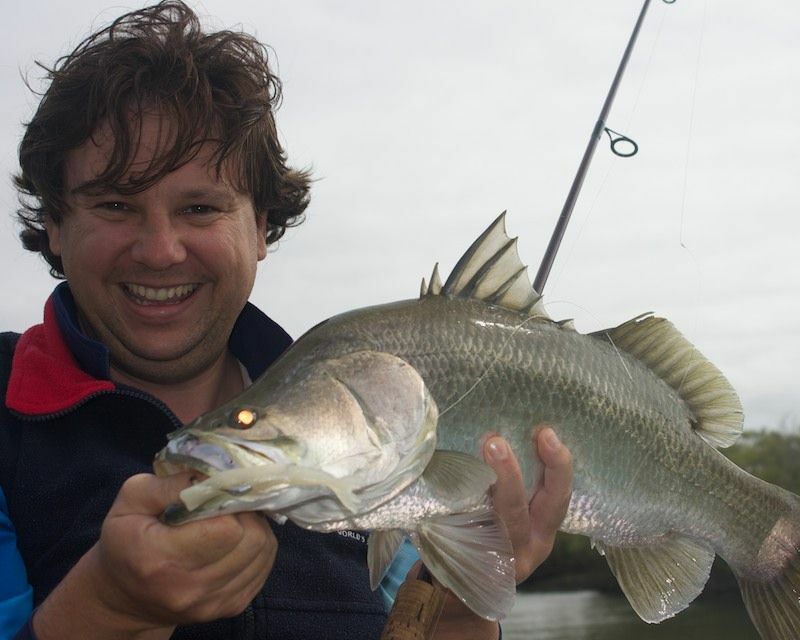 A better Barra was now dancing around the back of the boat. I was up the front and had to make a quick dash down the back to work the fish around the motor. Memories of my trip across the eski last time I did this came flooding back! 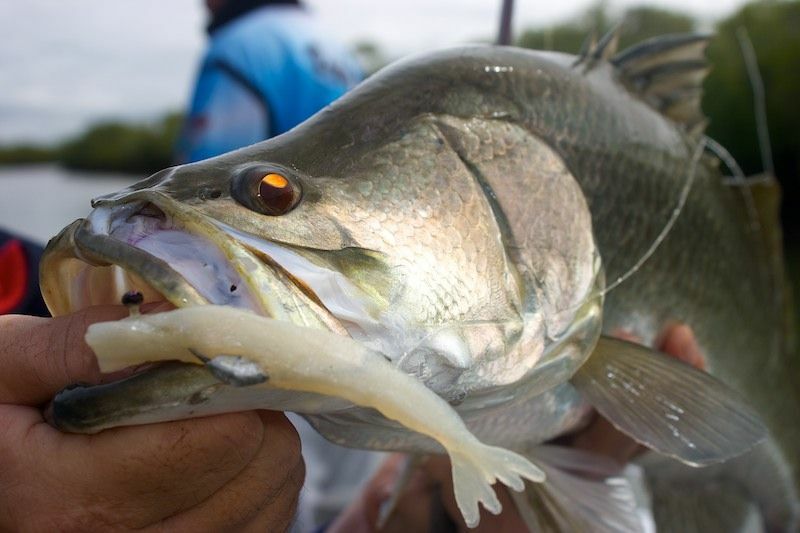 Luckily the fish had jumped clear of the snags and was now tussling it out in open water. From hear it was pretty easy going on the 8lb PowerPro and the 62cm fish was quickly lead to the net. Things went rather quiet from here, so we decided on a change in scenery. We passes a couple of 12foot Crocs and found a section of bank that looked good. Nev finally managed to put a few quality Bream in the boat and Phil landed a nice Grunter, Bream and a small Jack. I got dusted again on a big fish and had to resort to a DOA for a while. I missed a couple more hits and landed a nice Flathead. By 4pm we had had enough for the day and headed off home. Another cold run home in misty rain! Not a bad mornings fishing in very tough conditions. Thanks Phil and Nev for a wonderful day on the water. These guys really know how to enjoy themselves. A a hot brewed Coffee for breaky to warm the belly and a freshly cooked sausage in bread for lunch. Then a nice cold beer in the arvo to celebrate the day. Now thats the way to go fishing! 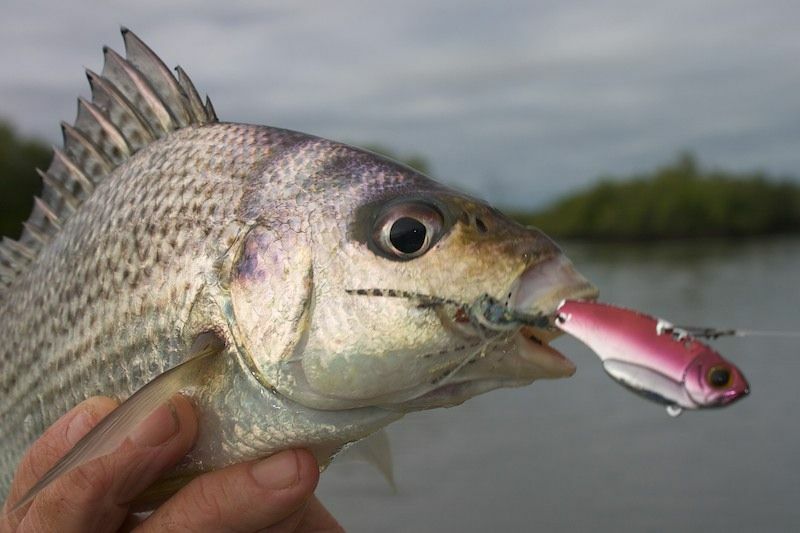 Overall I am very impressed with the JellPrawn lures, especially the weedless variety. I will be getting some more off Ben in the next few days. If you would like to try them out just click onto his website. Ben currently has free domestic postage on all his range. Otherwise you can catch up with Ben at the Cotters Markets every Sunday.